Love hair bows but not the price? 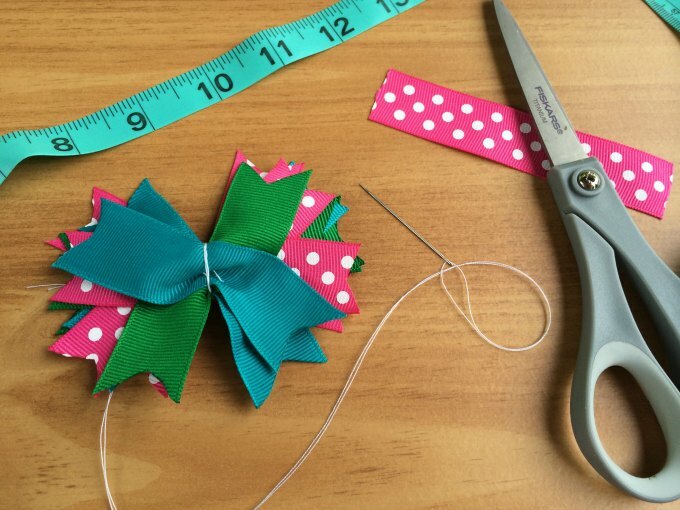 Follow this easy DIY tutorial and learn how to make hair bows out of ribbon in any color pattern you love! 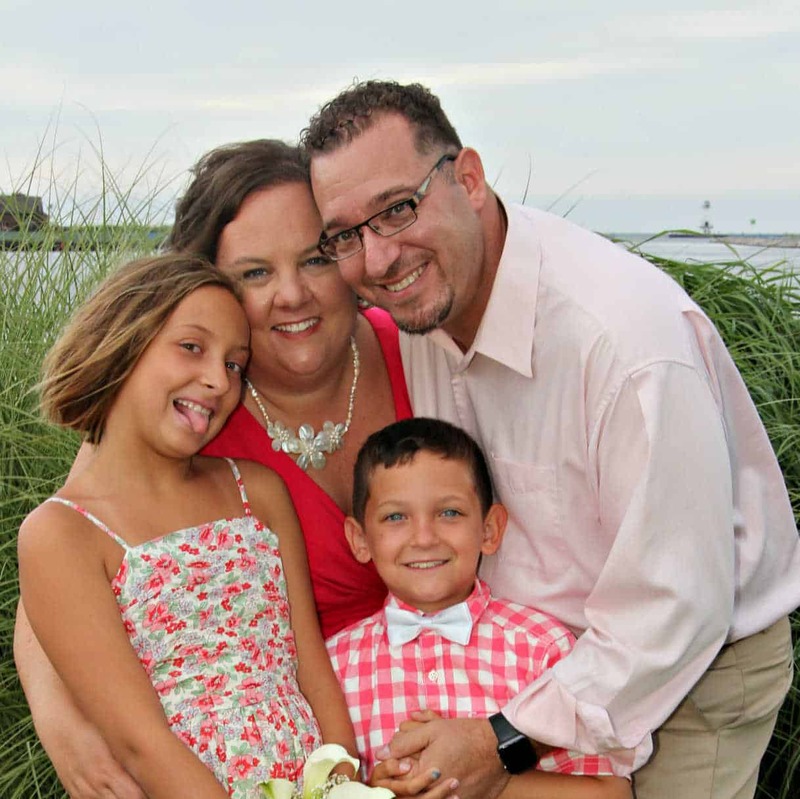 Like most mothers of daughters, we have gone through many hair bows over the years. Mostly my daughter wears the hair bow for about 10 minutes and then it ends up at the bottom of my purse or her school bag. Yet I find myself continuing to buy hair bows at every farmers market we go to in hopes that one day she'll actually wear one. I decided it was probably time to learn how to make hair bows out of ribbon. 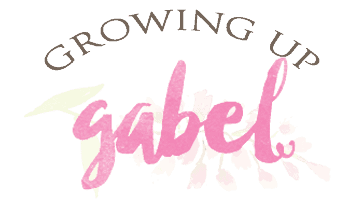 I've always got bits and pieces – or entire spools – of ribbon around the house. I seem to be really good at buying ribbon but not so great at using it up. Instead of buying hair bows, I can now make them. 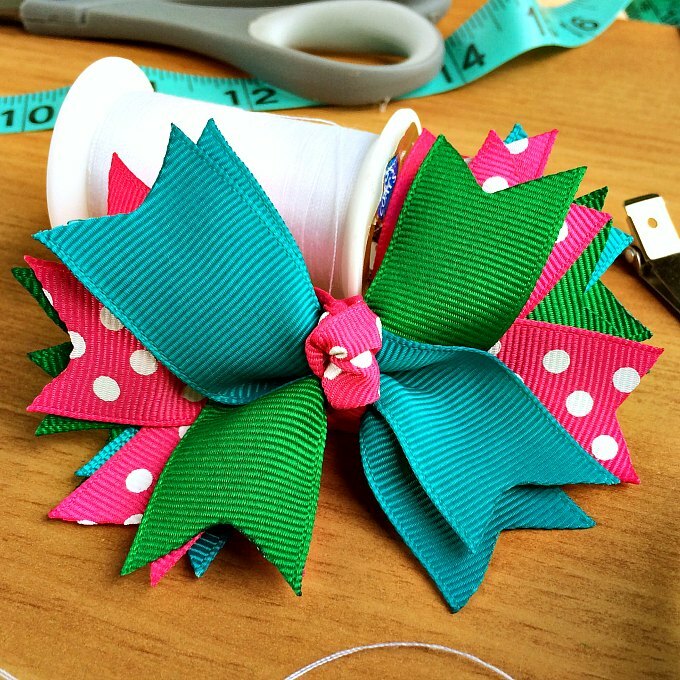 I'm really excited to make a few hair bows this fall that match our school uniforms. Begin by cutting the ribbon. 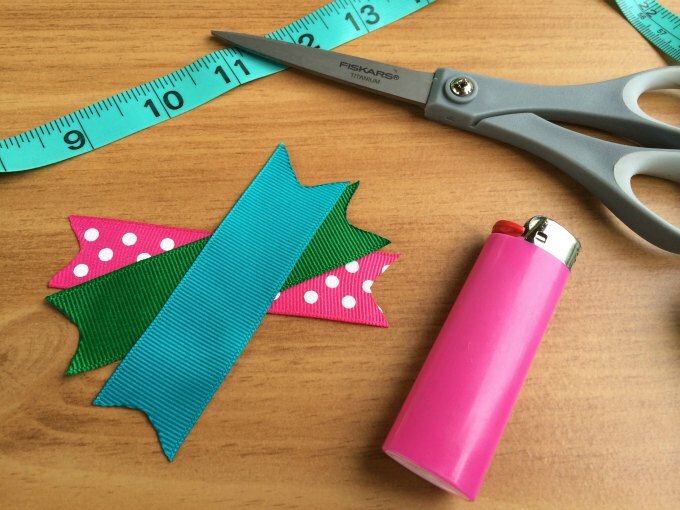 Cut the first color of ribbon into three, 3.5″ pieces. Then cut the second color ribbon into five, 3.5″ pieces. The pink polka dot was our second ribbon. Finally, cut the third ribbon into three, 3.5″ pieces. You can add the decorative little point in like pictured, cut the ribbon straight across or even pointed out. 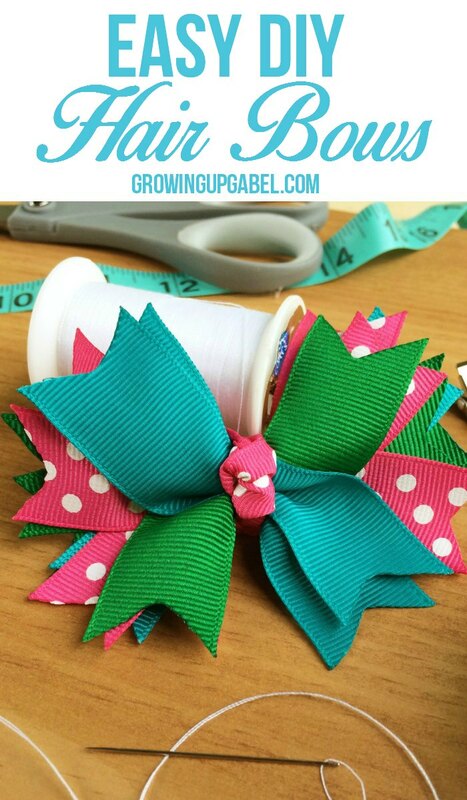 To make the bow, start layering the ribbons in a criss-cross type pattern on the table. Once you have a few layers, use the threaded needle to sew in the center of all ribbons to hold them together. When all the ribbons are laid out like you want, use the threaded needle to sew in and out the middle of the ribbon pile twice. Then, wrap the thread around center about 4 times and tie off tightly. 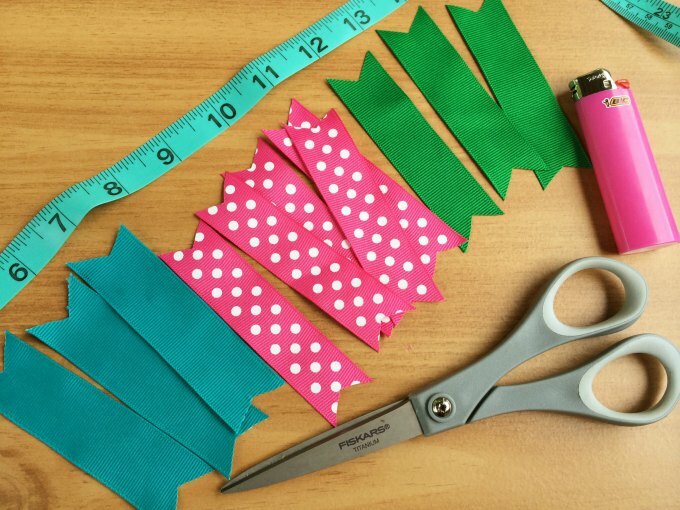 Cut a piece of ribbon of any color around 5″ long. Tie it around the thread in the middle of the bow to hide it. Knot the ribbon in the center. Hot glue the alligator clip on the back of bow. This works best with ribbon lined alligator clips. I love this tutorial, thank you for posting. Did you use wired ribbon for this? No – just regular ribbon. I bet! I love how versatile they are to make with any color and patterns. They are used to tie the middle of the ribbon. Thanks for sharing. I have been looking for something like this for a while. I too am a ribbon hoarder.lol I have a 3 year old great granddaughter, sometimes she will leave them in some times not. If she takes them home i never see them again. So I think it would be much cheaper to make. really great ! thanks ! Thanks for sharing your tutorial at the Inspiration Spotlight party. Pinned & shared. Hope to see you again soon. How pretty and what a great tutorial! Thanks for sharing on Snickerdoodle Sunday.